There’s a hot new bakery and eatery in Salt River. Owner Ciska Rossouw was head baker and chef at The Bakery at Jordan before opening Loaves on Long in 2015. Now she’s relocated the business and renamed it Loaves by Madame Baker. My business started as Loaves on Long when myself and a friend decided to take a leap of faith and try to make our dreams come true. It has been a rough ride to where we are today, but almost four years down the line I would take nothing back. Why did you choose this area to set up shop? Woodstock/Salt River is a beautiful trendy area. I feel like it’s a breath of fresh air compared to what I was used to in Long Street. Everyone seems so friendly and excited to have us here. I was looking for a place to relocate to from Long Street and had a space lined up to see. The agent also suggested another spot to show me. I walked in and fell in love! It was one of those right-place-at-the-right-time situations, and I’m so grateful! Why are the premises ideally suited to your business? I’m in a new development called Salt Orchard on Briar Street. The space boasts a beautiful deck wrapping all around my restaurant. It has a beautiful feeling of old and new coming together. Ample windows allow for a nice flow of air and natural light with fantastic views from the deck. Businesses like Table Seven, Food Jams, Dando Coffee and JPN Concept store. We also have a hotpod yoga studio, boxing gym, Italian cheese producers, shared office space and an IT company. What are the rental/sales prices like in this area? The prices in Woodstock and Salt River are very different from Long Street. I also feel that it’s much better value for money as you’re not merely paying for the Long Street name. Hard to say exactly, especially with us only being open for such a short while… but I have a steady flow of people coming through for breakfast or lunch and perhaps just to grab a cup of coffee. And our bread-baking classes are well attended. 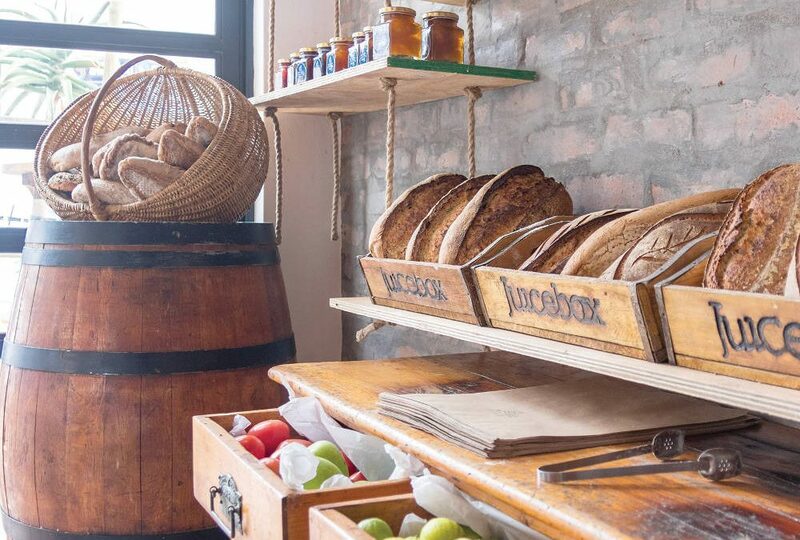 For now we’re focussed on having Loaves grow and making it the go-to bakery, breakfast and lunch stop in the area, but the plans to expand have always been there. Expansion and franchising ultimately. We’re having our website developed and our Ubereats and Orderin should be up and running shortly. At this point the most famous item is by far the “mother of dragons”: our spicy chicken aioli sandwich made with homemade pickled chili sauce. And a double flat white of course. Our gluten-free brownies also sell out faster that I can bake!